FEATURE — Standing atop Dixie Rock or even taking in the view in one of the parking lots off Red Hills Parkway, the most noticeable landmark of St. George’s skyline – even after the construction of recent large additions such as the Dixie Regional Medical Center or Dixie State University’s Holland Building – is the St. George Utah Temple of The Church of Jesus Christ of Latter-day Saints. The temple stands as a white beacon among a sea of trees, asphalt, concrete and other less distinct structures. It’s been there for over 140 years, and in its early days, it looked perhaps more out of place than it does today. And it was a lot more lonely – at least at first. Temples have been important to Christians since biblical times with the likes of Moses’ portable tabernacle and King Solomon’s permanent, more ornate edifice. And so too, temple building has been important to members of the Church of Jesus Christ since its inception in 1830. The church built its first temple in Kirtland, Ohio, in 1836 – a monumental undertaking for a fledgling religious organization short on cash. It’s second temple, in Nauvoo, Illinois, was not even formally dedicated before the performance of sacred ordinances commenced in December 1845. Unfortunately, that temple would only to be utilized for a short time until its abandonment. Approximately 5,600 Saints received their endowments in the temple before most of them left Nauvoo in February 1846, heading west to eventually arrive in Utah in 1847. Upon arrival in Salt Lake City, choosing a site for a temple was one of the first things church President Brigham Young did. 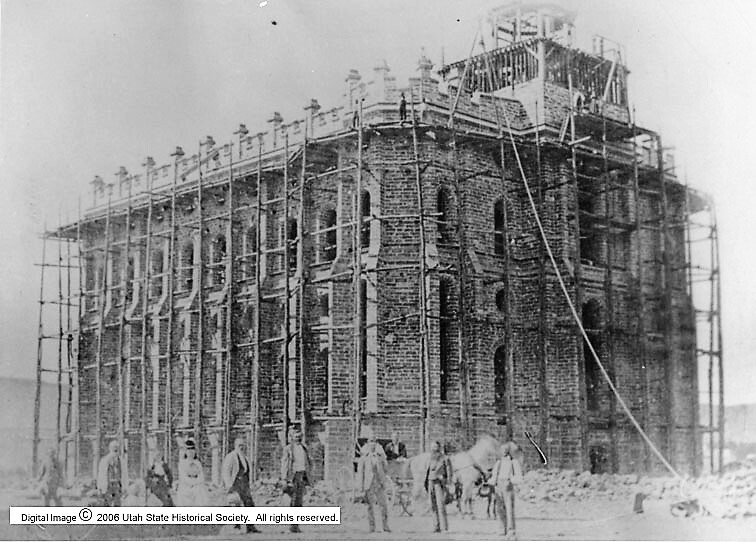 However, work did not commence on the Salt Lake temple until 1853 and was mired in difficulties from the beginning, including covering the foundation to hide it from incoming federal troops (only to find it cracked and needing replacement when uncovered) and taking a break from construction to work on the railroad, among others. The Saints did erect a temporary substitute for a temple, the Endowment House in Salt Lake City, where many couples from Southern Utah settlements solemnized their marriages despite the difficult and time-consuming trip. It almost defies reason that the first temple built in the Utah Territory would be in St. George, a remote place not even settled until 1861. 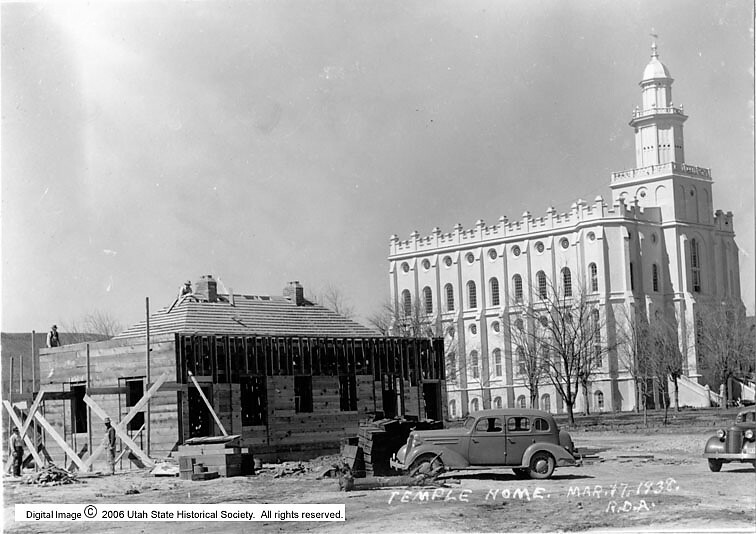 The decision to build the temple didn’t come until January 1871, when Young asked an assembled body of the St. George Stake Presidency, High Council and bishops. According to the account written by Andrew Karl Larsen in his book “I Was Called to Dixie,” the group’s response echoed that of Apostle Erastus Snow: “Glory! Hallelujah!” The official announcement to build the temple came in April of that year. By that time, Young, frustrated at the pace of construction of the temple in Salt Lake, was bound and determined to see another temple finished within his lifetime. 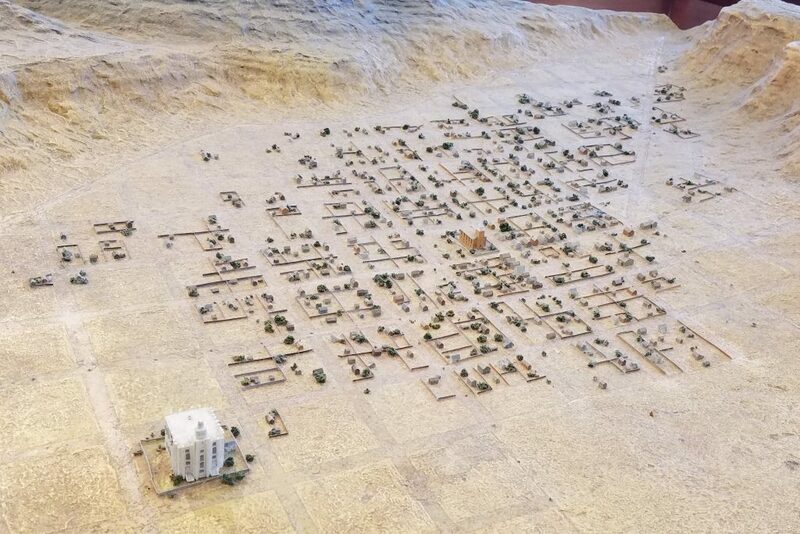 He felt Utah’s Dixie was an ideal place to build a temple because some of his most loyal followers were there, and its construction would be a way to unify the area’s residents and inspire them to remain in a place some felt was too inhospitable. Young’s choice of location was puzzlingto some – at the time it was southeast of the established town, but Young prophesied it would eventually be in the center. For instance, an early photo of St. George just after the temple was finished shows the conspicuous edifice away from main town as does a diorama in the temple’s visitor center annex. It’s easy to see today that Young’s prophecy has come true. The location also defied conventional wisdom in another way: Nearly three-fourths of the temple block was a marshy bog. Only the northern fourth, consisting of solid limestone, could have been considered fit enough to support the future structure’s weight. But Brother Brigham insisted the temple be on that spot, despite the extra work to prepare a solid foundation, a metaphor so often compared to the basis of each member’s testimony of Jesus Christ himself. To finance the edifice, the plan was to use the tithing from members in wards from Beaver and farther south. 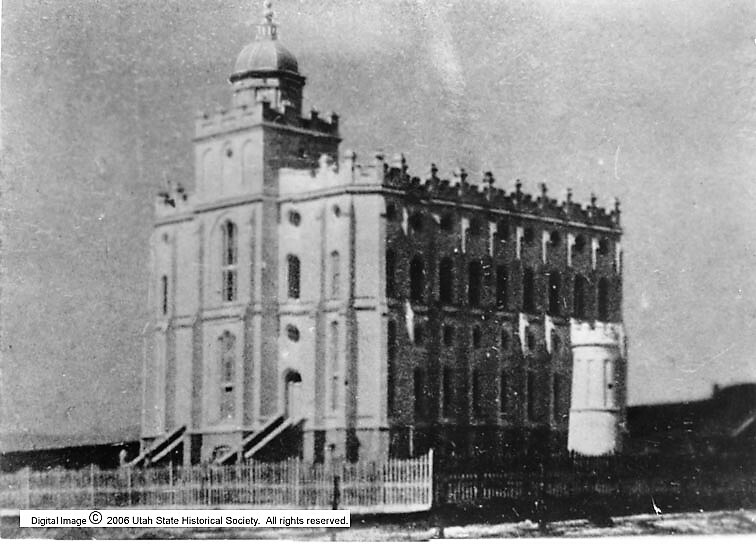 At a conference held November 3-5, 1871, Young touted St. George as an ideal spot for a temple, saying that the fledgling city and its surrounding settlements were better able to complete a temple than the whole body of the church was during the construction of the Kirtland and Nauvoo temples. He asked the people at the conference if they would go ahead and build the temple, to which he was answered with a resounding yes, Larsen wrote. A few days after the conference, on Nov. 9, a ceremony dedicating the block and breaking ground for the temple took place, again to an enthusiastic crowd who, in almost one voice, affirmed to their president that they were ready to build a temple. The Southern Utah Saints wasted no time in getting started as excavation began in the afternoon on the day of the dedicatory service. By January 1872, 150 men were working on digging out the foundation. 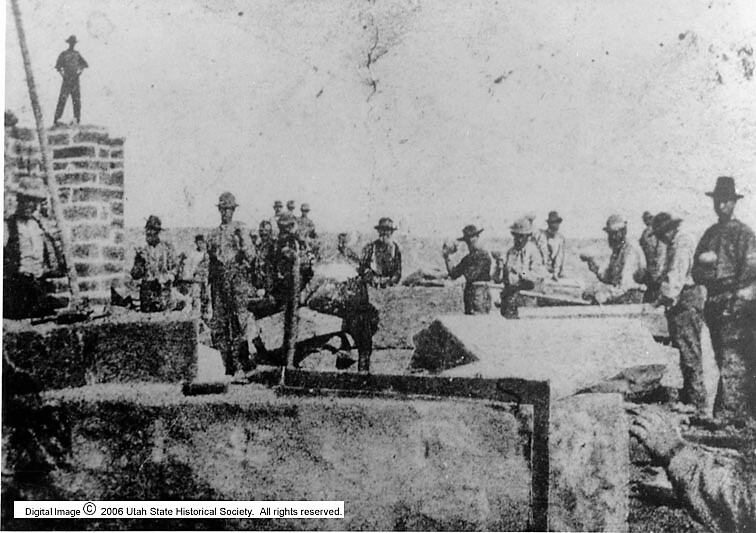 To make the foundation sturdy enough to support the structure, construction crews drained the ground and brought in thousands of tons of volcanic rock from a nearby mesa, where the first St. George Airport once stood, and pounded it down using an improvised piledriver fashioned from a small cannon barrel reputedly utilized during the Mexican-American War. It was an excellent example of pioneer ingenuity, Larsen noted. They rigged the cannon to a cable system that pulled it into the air then dropped its heavy weight to pound the foundation stones into the wet soil. When the footings were in, they began laying the foundation stones, quarried from the highest section of the Black Hill west of St. George. These stones used for the foundation were anywhere from 7 to 12 feet long, 3 to 5 feet wide, and 12 to 14 inches thick. The basement foundation walls became 4 1/2 feet thick. The foundation was finished on Feb. 21, 1874. In the spring of 1874 volunteer crews fashioned a road to Mount Trumbull on the Arizona Strip and built a sawmill to obtain the necessary lumber, as they could not count on Pine Valley as it was busy supplying lumber to mining towns that paid cash. Getting the lumber to the temple site was a difficult challenge as some of the logs used measured up to 26 feet long, which was more than twice the length of a wagon. Traversing steep and winding roads in such circumstances was quite a challenge. Masons quarried the sandstone for the temple walls in the same place it was cut for the Tabernacle, where Red Hills Golf Course is now. Raising those walls, which were later plastered white, took approximately two years. Once the walls were done, workers fashioned a timber roof and commenced interior work. 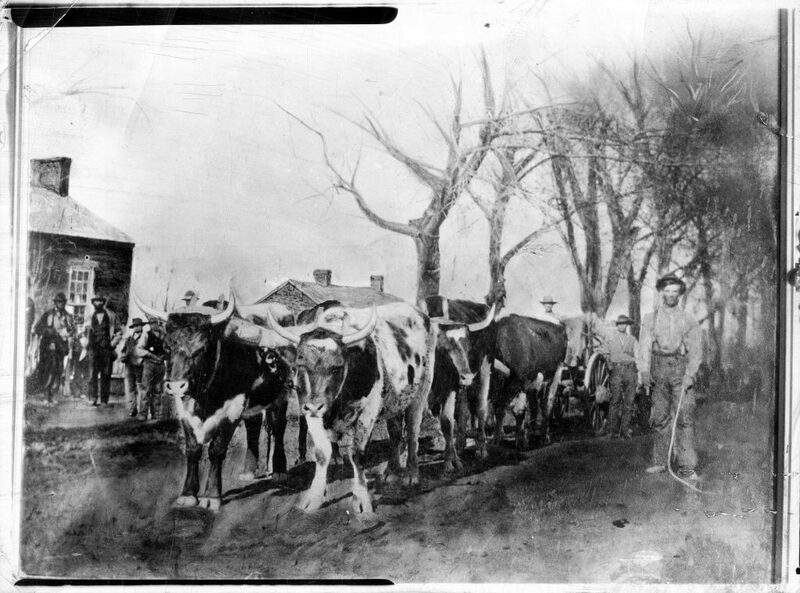 Iron oxen were cast in Salt Lake City for the baptismal font and made a laborious trip to their final resting place – mostly at night to avoid the heat – fittingly in ox-pulled wagons. Construction crews were called to work on the temple from all around the state, including quite a contingent both from Cache and Sanpete counties. Northern Utah farmers could not work much on their farms during the winter, so some decided to head south for the winter and work on the temple. Many of the workers learned the necessary construction skills on the job. Astoundingly, no worker was killed during the temple’s construction, but some were injured. One worker fell 70 feet and wasn’t expected to live but was back two weeks later to visit the site. By the spring of 1876, most of the workers who had come from afar had returned home, leaving most of the finish work to the local settlers. In comparison to the Salt Lake Temple, which took forty years, the St. George Utah Temple was built at lightning speed, only 5 1/2 years. 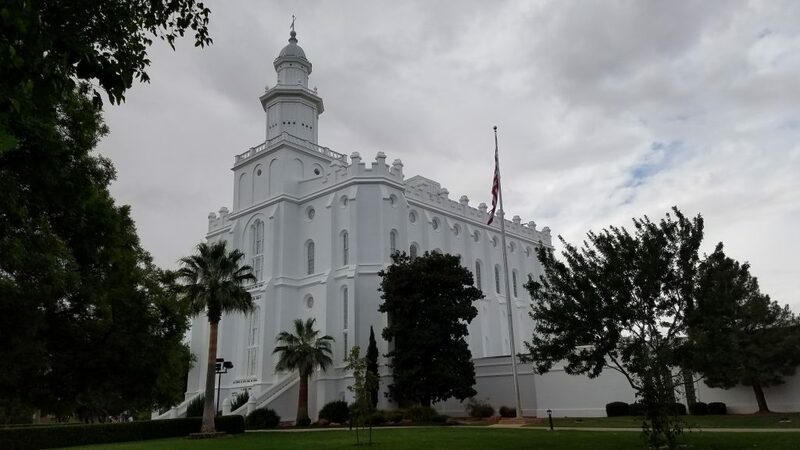 The St. George, Utah Temple stands as a monument to the faith, determination and skill of the early residents of St. George, who made great sacrifices to serve God and build a temple in the desert. Fine craftsmanship and attention to detail showed the Latter-day Saints’ devotion to God and reverence for His house. Every aspect of construction and all materials used were dedicated to the Lord. First temple president Wilford Woodruff – who later became the fourth president of the church – dedicated the baptismal room and lower floor of the temple on Jan. 1, 1877. Temple ordinances began to be performed on Jan. 9. 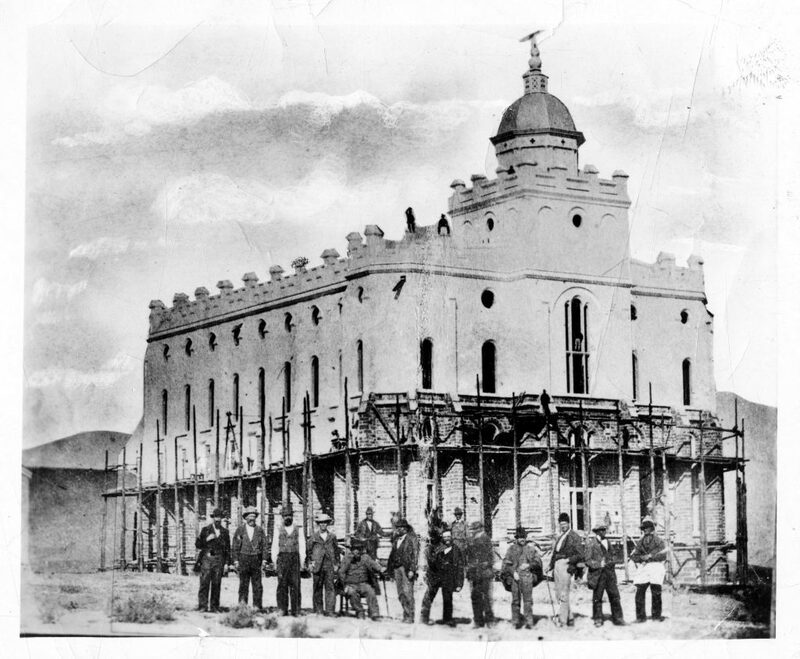 The church held its April General Conference in St. George to dedicate the temple on April 6, 1877. Daniel H. Wells, second counselor in the church’s First Presidency, was the leader who formally dedicated the temple. The dedication that year meant that Young did, in fact, see another temple built in his lifetime. But when Young inspected the completed building, he was disappointed with its steeple, saying it was too short and not dignified enough for such a sacred edifice. Even though he didn’t demand the tower be altered, his displeasure about it was no secret. Young died just short of five months after the dedication. As if to please Brother Brigham posthumously, lightning struck the tower two years later, requiring it to be replaced. In deference to Young, the new tower was twice the height of the former one, Alder and Brooks noted. Many people are aware that St. George was the first temple built in Utah and the first west of the Mississippi. However, Alder suggests there is much more to its importance. 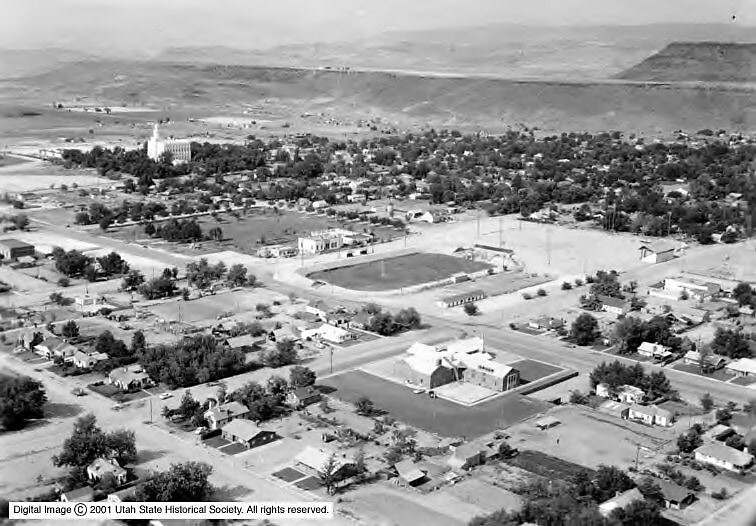 Previous to the construction of the St. George Utah Temple, patrons could only receive their own endowments. The St. George temple was the first in which patrons could complete endowments for the dead. Probably the most famous deceased persons to have their temple work done in the St. George were the Founding Fathers, who reportedly appeared to Woodruff and asked that their work be completed. A painting depicting Woodruff’s encounter with the likes of George Washington, Benjamin Franklin and their counterparts, hangs in the temple’s lobby. Alder, a former Dixie State College president and history professor, as well as current St. George Temple sealer, said in an interview for this story that before the dedication of the St. George temple, Brigham Young and Wilford Woodruff met frequently to codify the wording of all the temple ordinances. The day after the dedication ordinances began using the language standardized by Young and Woodruff, Alder said, and to this day, that is the verbiage used in the temple ordinances. The other importance of the St. George temple is that it is a close “cousin” to its predecessors in Kirtland and Nauvoo, Alder said. Joseph Smith himself designed the Kirtland temple, and Truman Angell, the architect of the St. George temple as well as the temple in Salt Lake City, was an assistant architect of the Nauvoo temple. The design of the St. George temple was copied from Nauvoo, Alder said, and when the church rebuilt the Nauvoo temple in 1999-2002, it looked at the St. George temple as a template for its interior. The Logan and Manti temples, built within the decade immediately after the dedication of the St. George temple, also follow a similar plan, Alder noted. As with all pioneer-era temples, the interior of the temple is not the same as it was when it was dedicated. It was redesigned in 1937 and again in 1975. Before the 1937 remodel, temple patrons entered through the basement, which was where the ordinance rooms were located, Alder said, but they only seated 25 people. That renovation moved the ordinance rooms to the first floor, allowing them to become more spacious, and built an annex on the east side near the front, which became the new temple entrance. While the temple underwent this remodel, several outlying stakes built temple cottages so their members, traveling from a greater distance, would have a place to stay for a few days while they worked in the temple. The 1975 remodel was more extensive and included the construction of a new annex on the north side that included new dressing rooms, four more sealing rooms, temple offices and a clothing rental area. It also included the addition of an elevator. After the 1975 remodel, the temple utilized films for its endowment sessions which are much more efficient than live actors reciting lines, a practice still done in the Manti and Salt Lake temples. Using the films made it possible for more temple work to be done, as several sessions could go on simultaneously. 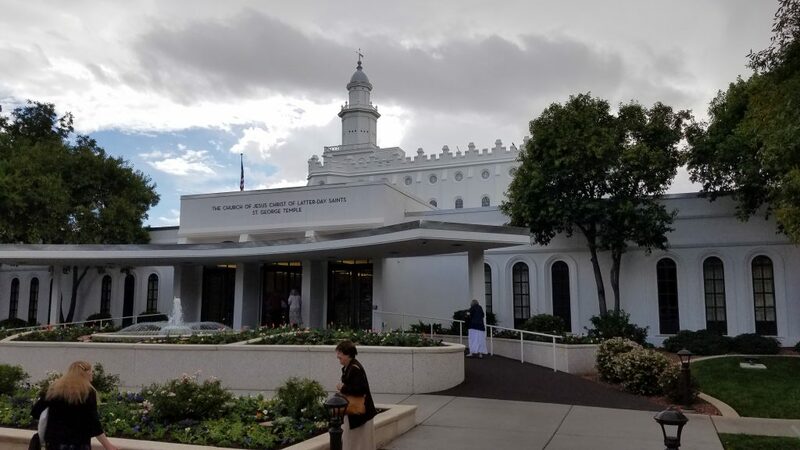 Since the 1975 remodel, the temple has remained nearly untouched, except for some damage sustained in a 1992 earthquake, which caused some walls to lean out. This incident prompted some church officials to consider tearing down the original structure and building a new temple. After further inspection, the building was deemed fit to keep standing, and it was reinforced instead of the more dire alternative. 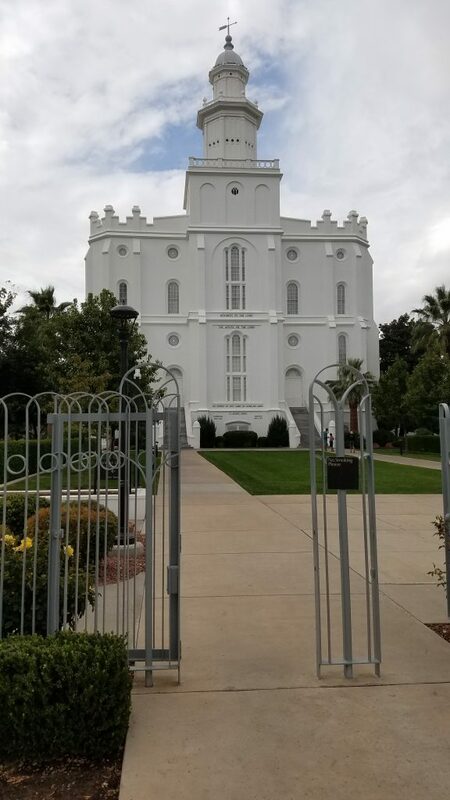 That earthquake caused greater damage to the St. George Tabernacle because it didn’t have something the temple had from the beginning: If one stands in front of the St. George temple and looks closely, one will notice pilasters on both sides that help push the walls in, which Alder said saved the structure from more damage. Alder noted that one of the things about the temple’s history that truly stands out to him is its location, which experiences water problems to this day. The foundation has been worked on time and time again, and water is still being pumped out from underneath the edifice. Despite thoughts of tearing it down a few times over the course of its history, it has remained. One story that has circulated is that during the 1975 renovation, architects and construction experts advised President Spencer W. Kimball to tear down the original structure and rebuild, but Kimball is reported as saying their would be a revolution if it were torn down. According to Alder’s research, however, that tale is not substantiated. Alder said he doesn’t know what current church President Russell M. Nelson’s intentions are by recently announcing an additional temple in Washington County. He said it could be that the church leadership feels there is enough population to support the new temple and keep it busy, or there is a chance the new temple could replace the historic one. Speculation is already running rampant as to where the new temple could be. The projected purpose of the new temple adds yet another aspect ripe for more speculation. Most might think such a scenario is unlikely. And such a decision by the church could certainly start that revolution Kimball is alleged to have mentioned. 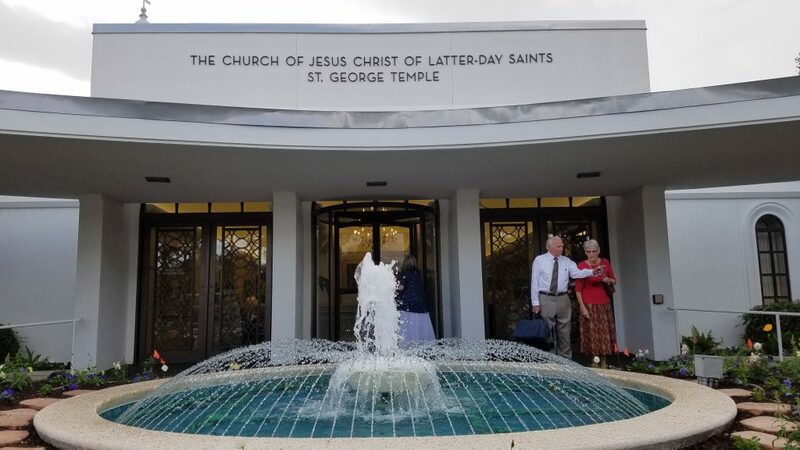 Located at 250 E. 400 South, only members of The Church of Jesus Christ of Latter-day Saints in good standing who possess a signed temple recommend can enter the actual temple itself. However, anyone can walk the well-manicured temple grounds and visit the temple’s two visitor centers. One visitor center is a small annex that includes a few exhibits about the temple’s history. 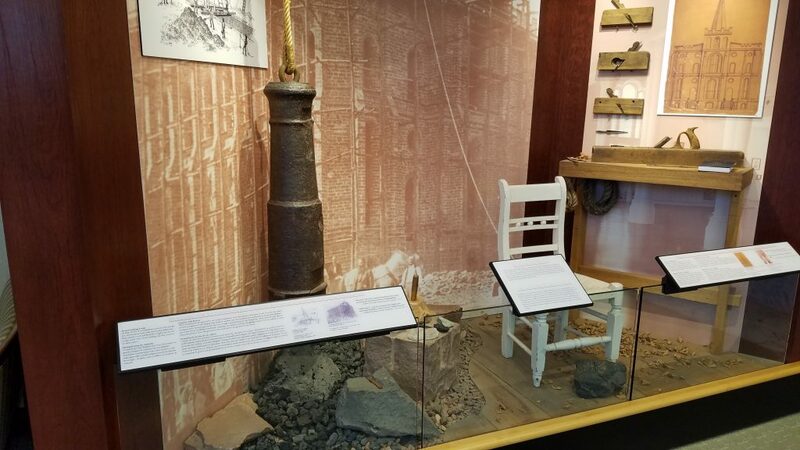 It includes a display that features the actual cannon (according to missionaries volunteering at the visitor center) used as the pile driver for the foundation footings. Also staffed by missionaries, the larger, main visitor center includes displays about the church itself, including a wide selection of video presentations visitors can watch. It’s main attraction is a Christus statue in the lobby of its main entrance. For more information about the St. George Utah Temple and Visitors’ Center, visit its website. Visitors wanting to find out more about church history in Southern Utah can also tour the Brigham Young Winter Home, Jacob Hamblin Home and Pine Valley Chapel. Even for a non-Mormon, touring the new temple in Cedar City is worth it. Trust me, I know. Once again, Mr. Wadsworth, excellent article, we’ll researched. Keep up the good work. Nice history lesson, thanks! I really need to check out the visitor center. Besides being the first in Utah, I think it’s the “oldest Temple in use by the COJCOLDS” as well. Kirtland is owned by the Reformed LDS and Nauvoo was demolished and rebuilt recently 1999-2002 or so. To be truly stunned, however, one must come upon the Manti Temple. For the life of me I cannot understand why a couple thousand cows and their tenders need that incredible castle. Great article Mr. Wadsworth, thank you, I am also impressed by the fact that this Temple was the first where Endowments for the dead were performed, the only Temple completed during Brigham Youngs 30 year tenure as President of the Church, and our founding Fathers, the framers of the United States Constitution had their Temple work done in this Temple as well. All of which makes me very proud and grateful. We are so blessed to live in this amazing place! Thanks for a great, timely article. I was at a small youth fireside where a former member of the building committee or church engineering department spoke and he shared firsthand information about the 1992 earthquake and the damage that was done. He said the engineers went through the whole structure of the Temple and recommended to church leadership that the Temple be turned into a historic site and a new Temple be built just south of it. President Hinckley (then of the First Presidency and the President of the Quorum of the Twelve) said no, do whatever you have to do to save the Temple and keep it operating. So they added a LOT of concrete, rebar, and other strengthening techniques to keep it in service. But no doubt its still in need of a major overhaul (seismic, structural, technology, A/C, etc). 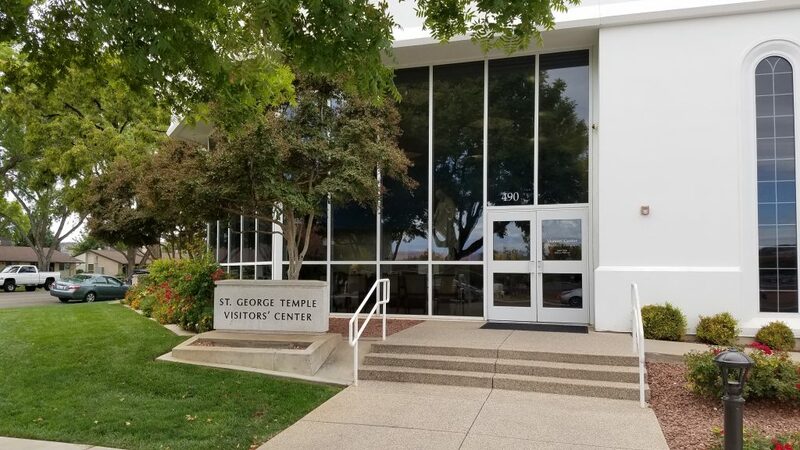 I don’t think we’re even close to needing or qualifying for a second Temple in St. George (especially after just losing 1/3 of our Temple district to the Cedar City Temple), but by the time they finish the newly announced Temple and close the St. George Temple for renovation (if that is their plan, vs closing it for good; I don’t think they’d ever actually tear it down) a decade will have passed with ridiculous levels of growth and we’ll be ready to support two Temples, and may even need them. Thanks for all the positive feedback, everyone. And what you’re suggesting seems feasible, Brian. If you’d like to follow the Days Series, you can like my author Facebook page for Days Series previews, updates and further information about local history!